Alastair Cook is in line to become the first England batsman since 2003 to top the Reliance ICC Test Player Rankings when his side takes on India in the fourth and last cricket Test which starts in Nagpur from Thursday. Captain Cook is currently ranked fourth in the table with 874 points, just five behind number-one ranked Shivnarine Chanderpaul. And although Michael Clarke is just one rating point behind Chanderpaul, Cook will have the first crack on the number-one ranking as his Test finishes a day before the Australia-Sri Lanka Test, which begins in Hobart on Friday, 14 December. With Cook having already scored 548 runs at an healthy average of 109.6 in the series so far, there is a strong possibility of him achieving the coveted number-one ranking for the first time in his career. The last England batsman to top the batting table was former England captain Michael Vaughan who surged to the top at the conclusion of the fifth and last Ashes Test in Sydney on 6 January 2003. In that match, Vaughan scored zero and 183 as England won by 225 runs. Vaughan finished with 633 runs, including three hundreds in that Ashes series and was voted player of the series. The other England batsmen to top the batting table are Graham Gooch in June 1994 and David Gower in February 1986. At the age of 40, Gooch became the oldest to hold the top spot in the batting charts since Jack Hobbs in 1928. The oldest to be the number-one ranked batsman ever was WG Grace in 1897 at the age of 49. 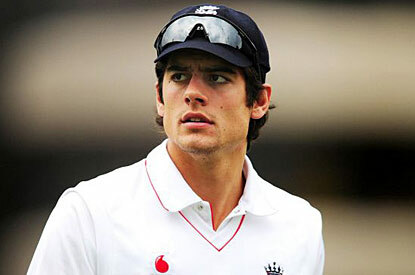 Cook has an opportunity to create history not just with his batting but also by hoping to achieve England's first Test series win in India since 1984-85. England currently leads the four-match series 2-1. While England is in line to create history in India, it can also retain the number-two spot on the Reliance ICC Test Championship table if it either wins or draws the final Test at Nagpur. If England was to win the final Test match it will gain a maximum of two ratings points to end at 119, while a draw would fetch it one ratings point (118). Consequently, if India was to level the series in Nagpur, England could slip to third place with a loss of two ratings point at 115. But this would happen only if Australia beats Sri Lanka by a margin of 3-0, as it would gain two ratings points and the second place. South Africa is the clear leader of the Reliance ICC Test Championship table with 123 ratings points. The Reliance ICC Test Championship table will be updated at the end of the Nagpur Test.